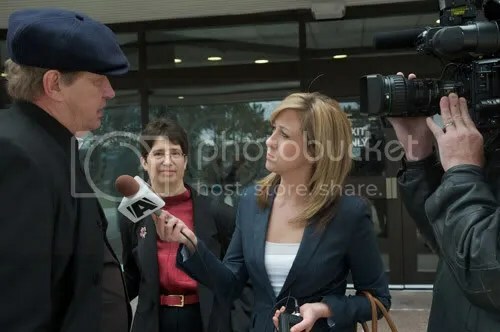 Lawyer Karen Selick talks to A Channel reporter yesterday at the Newmarket courthouse. Canadian Constitution Foundation litigation director Karen Selick will be a featured guest later today on CHCH television in Hamilton; she will be taking part in a panel discussion with Hamilton’s medical officer of health, and possibly a representative from the Dairy Farmers of Ontario (DFO). Sounds like we could be making history here. Tune in at 5:30 PM today, Thursday April 14th, 2011. Farmer Michael Schmidt talks to A Channel reporter. That's lawyer Karen Selick in the background. The Province of Ontario’s appeal of Justice Kowarsky’s January 2010 acquittal of raw milk farmer Michael Schmidt began yesterday at Newmarket court with Justice Peter Tetley presiding. “NEWMARKET, ONT. — Lawyers for the provincial government are arguing that an Ontario judge made critical legal errors when he ruled in favour of raw milk crusader Michael Schmidt.